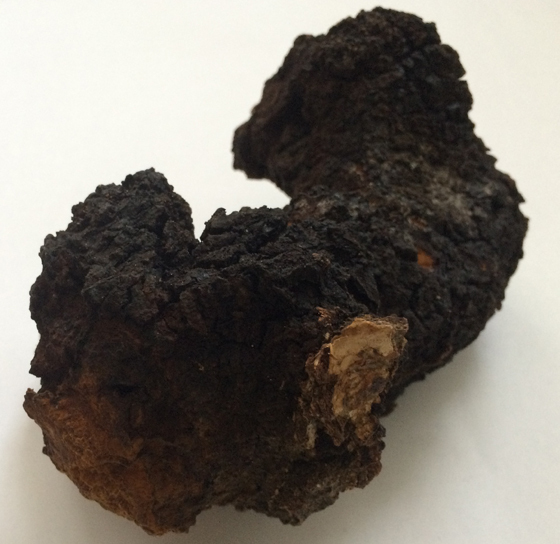 What is a chaga mushroom? Chaga mushroom (Inonotus obliquus) is a fungi that grows on birch trees and is the most potent antioxidant on this planet. 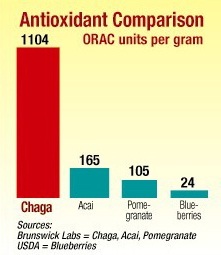 It tops the other famous antioxidants such as green tea, moringa tree and many more. Chaga is a primary adaptogen, cancer fighter, immune system modulator, anti-tumor agent, gastrointestinal tonifier, longevity tonic and genoprotective agent (DNA-shielding). Chaga’s purifying, detoxifying and healing properties have been known in Russia for centuries. People in Siberia still brew and drink chaga instead of black tea or coffee. Russian scientists have noticed that in areas where people regularly drink chaga tea, the rate of cancerous diseases among local folk have been much lower than in other regions and illnesses connected with stomach are almost unknown there. Many people in Siberia who drink chaga daily, usually live very long and healthy lives, some even over 100 years. Chaga mushrooms contain: polysaccharides, alkalines, phyto-nutrients, organic acids and many important minerals and micro-elements such as calcium, zinc, magnesium, chromium and others. Various substances found in chaga possess powerful anticancer and anti-tumor properties. Many anticancer properties are now being attributed to beta glucans and melanin. Chaga has a high level of melanin that protects DNA and fights radiation by activating the pineal gland. 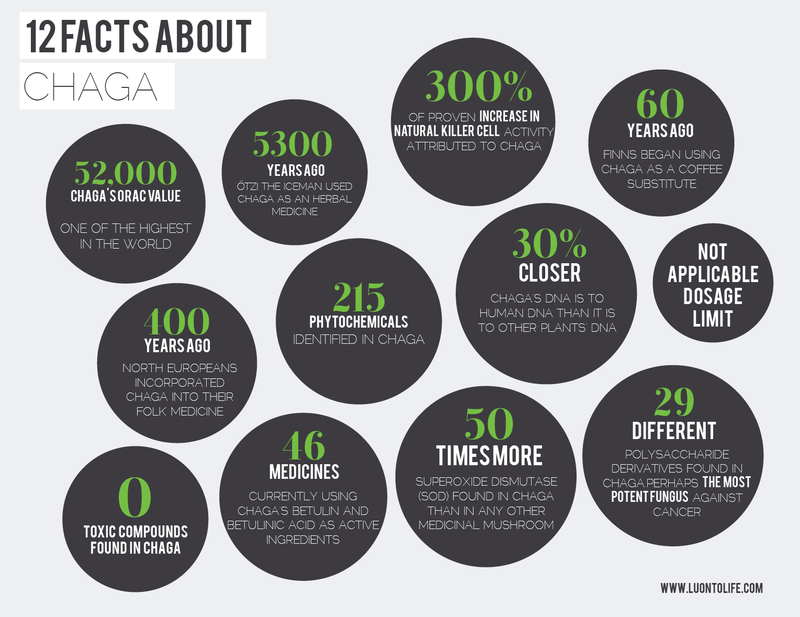 In Russia, chaga was approved for public use against cancer by the Medical Academy of Science in Moscow in 1955. Therefore Russian scientists are very confident about the healing properties of chaga, because numerous studies and clinical trials have been conducted in this country since then. In short, chaga mushrooms are one of the most potent superfoods, tonics and natural medicines available. Interest in chaga in the West began when Aleksandr Solzhenitsyn’s 1967 book Cancer Ward introduced his readers to chaga’s use as a traditional Slavic anti-cancer remedy. Another traditional remedy (related to birch trees) for all kinds of health problems (including caner) is birch sap juice which has similar health benefits such as detoxing and antioxidant properties. Chaga mushrooms have the highest ORAC score (Oxygen Radical Absorbent Capacity) for antioxidants ever recorded in any natural food! 1) Drink tea made of chaga mushrooms. This is my favourite way. It’s very easy. 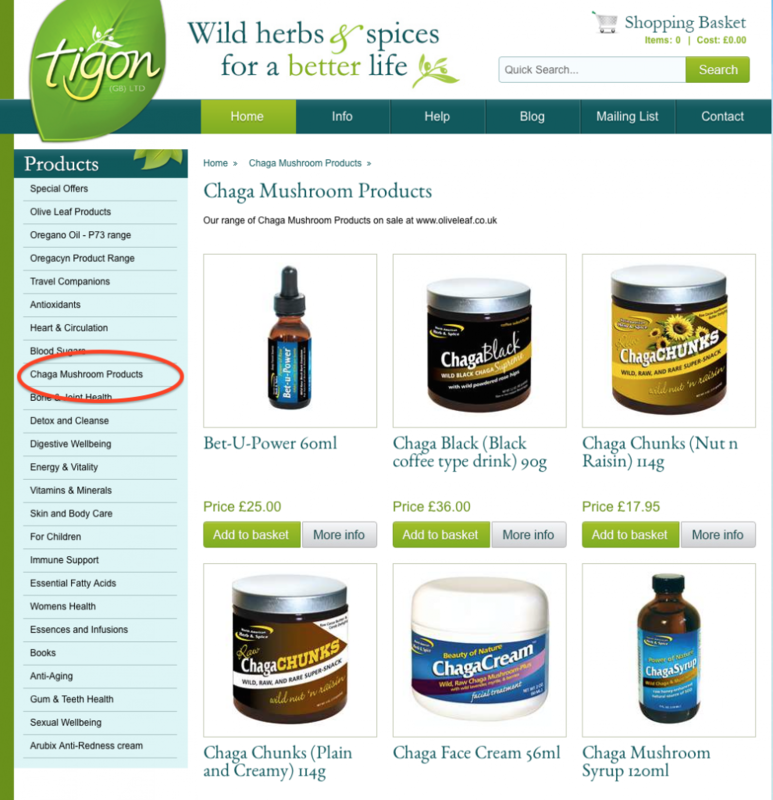 Get chaga mushroom online or better still try to find it locally (although this might be easier said than done!) Boil a small piece of chaga in a large amount of water for 30 minutes and then drink the tea. If it’s too strong, dilute it with some boiled water. You can reuse it for at least a month! Just add some more water next day and this time boil it for 1-2 minutes and then drink the tea. Keep reusing it until the tea is very weak – i.e. the colour is almost white. If the chaga tea is not too strong it has a very nice taste. I use glass cookware and keep the chaga on my stove all the time, drinking it two to three times a day or whenever I need it. (It’s a great anti-hangover remedy because it’s highly alkaline and detoxing). If you’re not using it continuously, then dry whatever is left over in an oven (NOT microwave oven!) and you can keep it for a long time (otherwise, if you leave it in the open air for a couple of days it will become mouldy!). NOTE: Rinse your mouth after drinking chaga tea – especially when it becomes very dark – because it might colour your teeth if you’re drinking it daily. 2) Chaga mushrooms drops. You can get chaga mushroom in liquid form / drops online – just add it to water. 3) Chaga mushroom tablets. The chaga mushroom tablets are an easy way to take chaga. 4) Chaga mushroom powder is another way to take chaga. Just boil the powder and drink it or pour it into your unadulterated bath water. But I believe the best way to get the most benefit from chaga mushrooms is to drink the tea. To completely embrace the birch tree healing properties, I use only xylitol – a healthy sugar alternative made of birch tree and I drink birch juice/sap. There is little evidence of contraindications for using chaga, but one should be aware of taking chaga in conjunction with immune suppressing medicines, the effects of which chaga may negate (e.g. cyclosporin containing products, used after a transplant). Additionally, consuming chaga mushroom in combination with blood-thinning medications may magnify their effects. Chaga may also interact with diabetes medications, which may cause blood sugar levels to fall too low. The long-term use of chaga in people with damaged nervous system may result in hyperexcitability. Chaga is not recommended for use in the case of several intestinal diseases such as chronic colitis or dysentery. Chaga may magnify the effects of anticoagulant medications such as warfarin and aspirin. Chaga is contraindicated for patients who are using penicillin or glucose given intravenously. It is always best to consult your doctor first, especially if you have some chronic diseases, or are pregnent or using specific medication (especially anticoagulant and hypoglycemic drugs). Chaga mushrooms are quite rare and not easy to find. The grow on birch trees (sometimes chaga is called birch mushroom) and usually like wet terrain, near rivers or streams. Chaga mushrooms like cold weather and are more present in northern parts of countries (Scandinavia, Russia, Poland, Canada, etc). If you want to see the range of images of chaga mushrooms just google ‘chaga mushroom’ and click on Images. The chaga specimen below, I found in Poland. I was lucky because it was winter and there were no leaves on the trees so I could spot it easily. Chaga mushrooms are quite rare and difficult to find so I was over the moon when I spotted my first chaga mushroom by the road in Poland (I’ve been looking for chaga for over a year now). 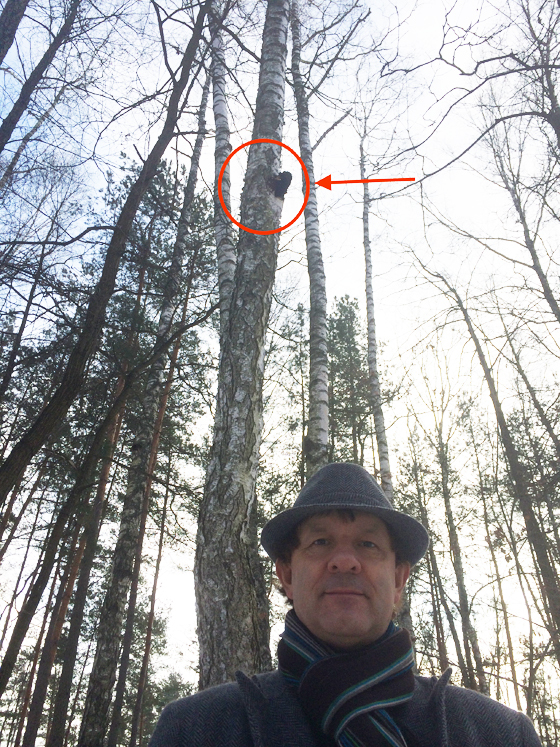 It was growing very high on the birch tree, 4 meters above the ground, but I’ve managed to knocked it down with a very long piece of wood. Oliveleaf has a selection of chaga mushroom products that are very easy to use. Separation of an aqueous extract Inonotus obliquus (Chaga). A novel look at the efficiency of its influence on proliferation of A549 human lung carcinoma cells. Mazurkiewicz W, Rydel K, Pogocki D, Lemieszek MK, Langner E, Rzeski W. Acta Pol Pharm. 2010 Jul-Aug;67(4):397-406.PMID: 20635536 [PubMed – indexed for MEDLINEAnticancer activity of subfractions containing pure compounds of Chaga mushroom (Inonotus obliquus) extract in human cancer cells and in Balbc/c mice bearing Sarcoma-180 cells. Optimization of hydroxyl radical scavenging activity of exo-polysaccharides from Inonotus obliquus in submerged fermentation using response surface methodology. Chaga supplementation resulted in a 54.9 percent (p < 0.001) reduction of H2O2 induced DNA damage within the patient group and 34.9 percent (p < 0.001) within the control group … Conclusively, Chaga extract reduces oxidative stress in lymphocytes from IBD patients and also healthy individuals when challenged in vitro (Najafzadeh et al., 2007). Phytochemical characteristics and hypoglycaemic activity of fraction from mushroom Inonotus obliquus. Anti-inflammatory effects of Inonotus obliquus in colitis induced by dextran sodium sulfate. Cancer cell cytotoxicity of extracts and small phenolic compounds from Chaga [Inonotus obliquus (persoon) Pilat]. Antioxidant activities of extracts and subfractions from Inonotus Obliquus. Anti-inflammatory effect of Inonotus obliquus, Polygala senega L., and Viburnum trilobum in a cell screening assay. Progress of research on Inonotus obliquus. Antitumor activity of water extract of a mushroom, Inonotus obliquus, against HT-29 human colon cancer cells. Oxidative stress response of Inonotus obliquus induced by hydrogen peroxide. Comparative study of antioxidant activity and antiproliferative effect of hot water and ethanol extracts from the mushroom Inonotus obliquus. Evaluation of antitumor activity of peptide extracts from medicinal plants on the model of transplanted breast cancer in CBRB-Rb(8.17)1Iem mice. Potential anticancer properties of the water extract of Inonotus [corrected] obliquus by induction of apoptosis in melanoma B16-F10 cells. Inotodiol, a lanostane triterpenoid, from Inonotus obliquus inhibits cell proliferation through caspase-3-dependent apoptosis. 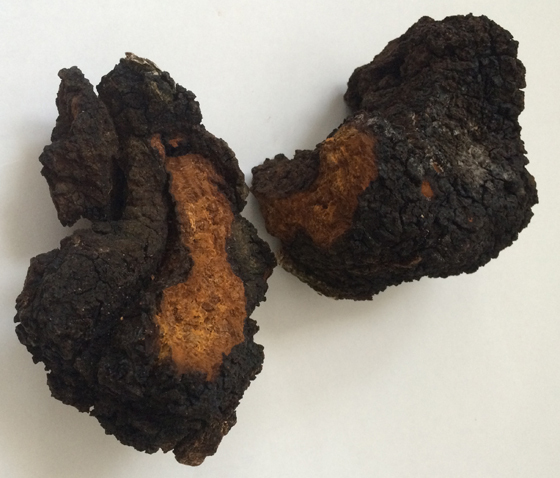 Antimutagenic effects of subfractions of Chaga mushroom (Inonotus obliquus) extract. Identification of Inonotus obliquus and analysis of antioxidation and antitumor activities of polysaccharides. Lanostane-type triterpenoids from the sclerotia of Inonotus obliquus possessing anti-tumor promoting activity. Identification of a novel blocker of IkappaBalpha kinase activation that enhances apoptosis and inhibits proliferation and invasion by suppressing nuclear factor-kappaB. New antioxidant polyphenols from the medicinal mushroom Inonotus obliquus. Antioxidant small phenolic ingredients in Inonotus obliquus (persoon) Pilat (Chaga). Analysis of aqueous extract of Inonotus obliquus. Chaga mushroom extract inhibits oxidative DNA damage in human lymphocytes as assessed by comet assay. Antioxidant effect of Inonotus obliquus. The effect of aqueous extracts from Inonotus obliquus on the mitotic index and enzyme activities. Antimitotic activity of aqueous extracts of Inonotus obliquus. Fungi in Khanty folk medicine. Effect of the extracts from fungus Inonotus obliquus on catalase level in HeLa and nocardia cells. Antitumor Activity of Triterpenes in Inonotus obliquus. Anonymous. 2004. Cytotoxic effect of Inonotus obliquus composition in HCT-15 human colon and AGS gastric cancer cells. Journal of the Korean Society of Food Science and Nutrition. 33:633-640. Alves, R. E., et al. 2002. Camu camu (Myrciaria dubia Mc Vaugh): a rich natural source of vitamin C. Proc. Interamer. Soc. Trop. Hort. 46:11-13. Ajith, T. A. and K. K. Janardhanan. 2007. Indian medicinal mushrooms as a source of antioxidant and antitumor agents. J. Clin. Biochem. Nutr. 40:157. Babitskaya, V. G,, Scherba, V. V., Ikonnikova, N.V., Bisko, N.A., and N.Y. Mitropoiskaya. 2002. Melanin complex from medicinal mushroom Inonotus obliquus (Pers:Fr.) Pilat (Chaga) (Aphyllophoromycetidae). Int. J. Med. Mushrooms. 4:139-45. Bobek, P., Ozdin, L., and I. Kajaba. 1997. Dose-dependent hypocholesterolemic effect of oyster mushroom (Pleurotus ostreatus) in rats. Physiol Res. 47:327-329. Bobek, P. and S. Galbavy. 1999. Hypocholesteremic and antiatherogenic effect of oyster mushroom (Pleurotus osteratus) in rabbits. Nahrung. 43:339-342. Burczyk, J., Gawron, A. Slotwinska, M., Smietana, B., and K. Terminiska. 1996. Antimitotic activity of aqueous extracts of Inonotus obliquus. Boll. Chim. Farm. 135:306. Chang, S. T. 1999. Global impact edible and medicinal mushrooms on human welfare in the 21st century: non-green evolution. Int. J. Med. Mushr. 1:1-7. Chen, C., Zheng, W., Gao, X., Xiang, X., Sun, D., Wei, J., and C. Chu. 2007. Aqueous extract of Inonotus obliquus (Fr.) pilat (Hymenochaetaceae) significantly inhibits the growth of sarcoma 180 by inducing apoptosis. American Journal of Pharmacology and Toxicology. 2:10-17. Chihara, G., Maeda, Y., Sasaki, T. and F. Fukuoaka. 1969. Inhibition of mouse sarcoma 180 by polysaccharides from Letin us eodes (Berk.) Nature. 222:687. Chorvathova, V., et al. 1993. Effect of oyster fungus on glycemia and cholesterolaemia in rats with insluin-dependent diabetes. Physiol. Res. 42:175-179. Cui, Yo, Kim, D. S., and K. C. Park. 2005. Antioxidant effects of Inonotus Oblique. J. Ethnopharmacol. 96:79-85.
de Sa, M. S., et al. 2009. Antimalarial activity of betulinic acid and derivatives in vitro against Plasmodium falciprum and in vivo in P. Berghel-infected mice. Parisitol. Res. Jul;105:275-279. Fulda, S, et al. 1997. Betulinic acid triggers CD95 (APO-1/Fas)- and p53-independent apoptosis via activation of capases in neuroectodermal tumors. Cancer Research. 57:4956. Fulda, S. 2008. Betulinic acid for cancer treatment and prevention. Int. J. Mol. Sci. 9:1096-1107. Fulda, S., Jeremias, I., Pietsch, T. and K. M. Debatin. Betulinic acid: a new chemotherapeutic agent in the treatment of neuroectodermal tumors. Klin Padiatr. 211:319-322. Gu, Y. and S. Gowsala. 2006. Cytotoxic effect of oyster mushroom Pleurotus ostreatus on human androgen-independent prostate cancer PC-3 cells. J. Med. Food. 9:196-204. Ham, S. S., et al. 2003. Antimutagenic and cytotoxic effects of ethanol extract from the Inonotus obliquus. J. Korean Soc. Food Sci. Nutr. 32:1088-94. Hawksworth, D. L. 2001. Mushrooms: the extent of the unexplored potential. Int. J. Med. Mushr. 2:1-9. Hossain, S., et al. 2003. Dietary mushroom (Pleurotus ostreatus) ameliorates atherogenic lipid in hypercholesterolaemic rats. Clin. Exp. Pharmacol. Physiol. 30:470-475. Hyun, K. W., Jeong, S. C., Lee, D. H., Park, J. S., and J. S. Lee. 1996. Isolation and characterization of a novel platelet aggregation inhibitory peptide from the medicinal mushroom, Inonotus obliquus. Boll. Chim. Farm. 135:306-309. In-Kyoung, L., Young-Sook, K., Yoon-Woo, J., Jin-Young, J., and Y. Bong-Suk. 2007. New antioxidant polyphenols from the medicinal mushroom Inonotus obliquus. Bioorganic & Medicinal Chemistry Letters. 17:6678-6681. Jeremias, I., et al. 2004. Cell death induction by betulinic acid, ceramide, and TRAIL in primary glioblastoma multiforme cells. Acta Neurochirurgica. 146:721-729. Kahlos, K., Kangas, L., and R. Hiltunen. 1987. Antitumor activity of some compounds and fractions from an n-hexane extract of Inonotus obliquus in vitro. Acta Pharm. Fennica. 96:33-40. Kharazmi, A. 2008. Laboratory and preclinical studies on the anti-inflammatory and anti-oxidant properties of rosehip powder—identification and characterization of the active component GOPO. Osteoarhritis and Cartilage. 16:55-57. Kim, B. K., Shin, G.G., Jeong, B.S., and J.Y. Cha. 2001. Cholesterol lowering effect of mushrooms powder in hyperlipidemic rats. J. Korean Soc. Food Sci. Nutr. 30:510-515. Kim, Y. O., et al. 2005. Immuno-stimulatory effect of the endopolysaccharide produced by submerged culture of Inonotus obliquus. Life Sci. 77:2438-56. Kim,Y. O., et al. 2006.Anti-cancer effect and structural characterisation of endo-polysaccharide from cultivated mycelia of Inonotus obliquus. Life Sci. 79:72-80. Koyama, T., Yeunhwa, G., and T. Akira. 2008. Fungal medicine, Fuscoporia obliqua, as a traditional herbal medicine, in vivo testing and medicinal effects. Asian Biomedicine. 2:459-469. Kraus-Zaki, J. 1957. (In Polish) ACTH jako czynnik hydrolizujacy kwasy dezoksyrybonukleinowe w zastosowaniu do bada cytoenzymatycznych. Haematologica. 1:48-50. Krauss-Zaki, J. 1962. Correspondence: Digestion of Cell Nucleus by Enzymes. Blood Journal. 19:527. Lindequist, U., Niedermeyer, T. H. J., and W-D Julich. 2005. The pharmacological potential of mushrooms. Institute of Pharmacy, Greifswald, Germany. Lull, C., Wichers, H. J., and H. F. J. Savelkoul. 2005. Antiinflammatory and immunomodulating properties of fungal metabolites (In) Mediators of Inflammation. Hindawi Publishing Corp.
McCord, J. M. and I. Fridovich. 1988. Superoxide dismutase: the first twenty years (1968-1988). Free Radic. Biol. Med. 5(5-6):363-369. Mizuno, T., et al. 1999. Antitumor and hypoglycemic activities of polysaccharides from Sclerotia and mycelia of Inonotus obliquus. Int. J. Med. Mushrooms. 1:306. Mizuno, T. 1999. The extraction and development of antitumor-active polysaccharides from medicinal mushrooms in Japan (review). Int. J. Med. Mushr. 1:9-30. Mothana, R. A. A., Awadh, N. A. A., Jansen, R.,Wegner, U., Mentel, R., and U. Lindequist. 2003. Antiviral lanostanoid triterpenes from the fungus Ganoderma pfeifferi BRES Fitoteraia. 74:483-485. Muller, F. L., et al. 2006. Absence of CuZn superoxide dismutase leads to elevated oxidative stress and acceleration of age-dependent skeletal muscle atrophy. Free Radic. Biol. Med. 40:1993-2004. Najafzadeh, M., et al. 2007. Chaga mushroom extract inhibits oxidative DNA damage in lymphocytes of patients. Biofactors. 31:191-200. Nakagawa-Goto, K., Taniguchi, M., Tokuda, H., and K. H. Lee. 2008. Cancer preventive agents 9. Betulinic acid derivatives as potent cancer chemopreventive agents. Bioorg. Med. Chem. Lett. 1;19:3378-3381. Nasar-Abbas, S. M. and A. Kadir Haikman. 2004. Antimicrobial effect of water extract of sumac (Rhus coriaria L.) on the growth of some food borne bacteria, including pathogens. J. Food Micro. 10:1016. Nicolson, G. L., et al. 2000. Diagnosis and integrative treatment of intercelluar bacterial infections in chronic fatigue and fibromyalgia syndromes, GulfWar Illness, and rheumatoid arthritis and other chronic illnesses. Clin. Prac. Alt. Med. 1:92. Nicolson, G. L. 2002. Co-infections in fibromyalgia syndrome, chronic fatigue syndrome, and other chronic illnesses. National Fibromyalgia Partnership—Fibromyalgia Frontiers. 10:5-9; 27-28. Papas, A. M. (ed). 1999. Anitoxidant Status, Diet, Nutrition, and Health. Boca Raton: CRC Press. Park,Y. M., et al. 2005. In vivo and in vitro anti-inflammatory and antinociceptive effects of the methanol extract of Inonotus obliquus. J. Ethnopharmacol. 101:120-128. Park,Y. M., et al. 2007. In vivo and in vitro anti-inflammatory and antinociceptive effects of the methanol extract of Inonotus obliquus. J. Med. Food. 10:80-90. Rein, E., Kharazmi, A., and K. Winther. 2004. A herbal remedy, Hyben Vital (stand. Powder of Rosa canina fruits) reduces pain and improves general welbeing in patients with osteoarthritis- a double-blind, placebo controlled randomized trial. Phytomedicine. 11:383. Rzymowska, J. 1996. The effect of aqueous extracts from Inonotus obliquus on the mitotic index and enzyme activities. Boll Chim. Farm. 135:306-309. Sarkar, F. H. andY. Li. 2006. Using chemoprevention agents to enhance the efficacy of cancer therapy. Cancer Res. 66:3347. Sawada, N., et al. 2004. Betulinic acid augments the inhibitory effects of vincristine on growth and lung metastasis of B16F10 melanoma cells in mice. British Cancer Journal. 90:1672. Scott, Cyril. 1944. Health, Diet, and Common Sense. London: the Homeopathic Publishing Co.
Shin, Y., Tamai, Y., and M. Terazawa. 2000. Chemical constituents of Inonotus obliquus sclerotium. Eurasian Journal of Forest Research. 1:43-50. Shivrina, A.N. 1967. Chemical characteristics of compounds extracted from Inonotus obliquus. Chem. Abstr. 66:17271-17279. Sudhakar, C., Sabitha, P., Shashi, K. R. and S. Safe. 2007. Betulinic acid inhibits prostate cancer growth through inhibition of specificity protein transcription factors. Cancer Research. 67:2816. Sung, B., et al. 2008. Identification of a novel blocker of lkappaBalpha kinase activation that enhances apoptosis and inhibits proliferation and invasion by suppressing nuclear factor-kappaB. Mol. Cancer Ther. 7:19-201. Takada, Y. and B. B. Aggarawal. 2003. Betulinic acid suppresses carcinogen-induced NF-kB activation through inhibition of lkappaB alpha kinase and p65 phosphorylation: abrogation of cyclooxygenase-2 and matrix metalloprotease-9. Journal of Immunology. 171:3278. Wang, H., Gao, J., and T. B. Ng. 2000. A new lectin with highly potent antihepatoma and antisarcoma activities from the oyster mushroom Pleurotus ostreatus. Biochem. Biophys. Res. Commun. 275:810-816. Wick, W., Grimmel, C., Wagenknecht, B., Dichgans, J. and M. Weller. 1999. Betulinic acid-induced apoptosis in glioma cells: A sequential requirement for new protein synthesis, formation of reaction oxygen species, and caspase processing. J. Pharmacol. Exp. Ther. 289:1306-1312. Willmann, M. et al. 2009. Characterization of NVX-207, a novel betulinic acid-derived anti-cancer compound. Eur. J. Clin. Invest. 39:384. Winther, K., Apel, K. and G. Thamsborg. 2005. A powder made from seeds and shells of a rose-hip subspecies (Rosa canina) reduces symptoms of knew and hip osteoarhritis: A randomized, double-blind placebo controlled trial. Scand J. Rheumatol. 34:302. Yesilada, E., et al. 1997. Inhibitory effects of Turkish folk remedies on inflammatory cytokin: interleukin-1 alpha, interleukin-1 beta, and tumor necrosis factor alpha. J. Ethnopharmacol. 58:59-73. Ying-Mee, T., Yu, Rong, and J. M. Pezzuto. 2003. Betulinic acid induced programmed cell death in human melanoma cells involves mitogen-activated protein kinase activation. Clinical Cancer Research. 9:2866. Joo, J.I., Kim, D.H., Yun, J.W. 2010. “Extract of Chaga mushroom (Inonotus obliquus) stimulates 3T3-L1 adipocyte differentiation.” Phytother Res. 24 (11):1592-9. doi: 10.1002/ptr.3180. Ko, S.K., Jin, M., Pyo, M.Y. 2011. “Inonotus obliquus extracts suppress antigen-specific IgE production through the modulation of Th1/Th2 cytokines in ovalbumin-sensitized mice.” J Ethnopharmacol. 137 (3):1077-82. E-pub July 28, 2011. Najafzadeh, M., Reynolds, P.D., Baumgartner, A., Jerwood, D., Anderson, D. 2007 “Chaga mushroom extract inhibits oxidative DNA damage in lymphocytes of patients with inflammatory bowel disease.” Mol Cells. 31 (2):165-73. E-pub Dec. 22, 2010. Park, Y.K., Lee, H.B., Jeona, E-J., Jungb, H.S., Kang, M.H. 2004. “Chaga mushroom extract inhibits oxidative DNA damage in human lymphocytes as assessed by comet assay” BioFactors 21:109-112. Stamets, P., 2008. U.S. Patent Application # 12/284,646. “Antiviral and Antibacterial Activity from Medicinal Mushrooms.” Filed September 24, 2008. Won, D.P., Lee, J.S., Kwon, D.S., Lee, K.E., Shin, W.C., Hong, E.K. 2011. “Immunostimulating activity by polysaccharides isolated from fruiting body of Inonotus obliquus.” Mol Cells 31(2):165-73. E-pub 22 Dec. 2010. The information contained in this post is intended for informational and educational purposes only. Any statements made on this post have not been evaluated by the FDA and any information or products discussed are not intended to diagnose, cure, treat or prevent any disease or illness. Please consult a healthcare practitioner before making changes to your diet or taking supplements that may interfere with medications. Posted in Health and tagged Birch mushrooms, Chaga mushrooms, Chi booster, Scientific research on chaga mushrooms.